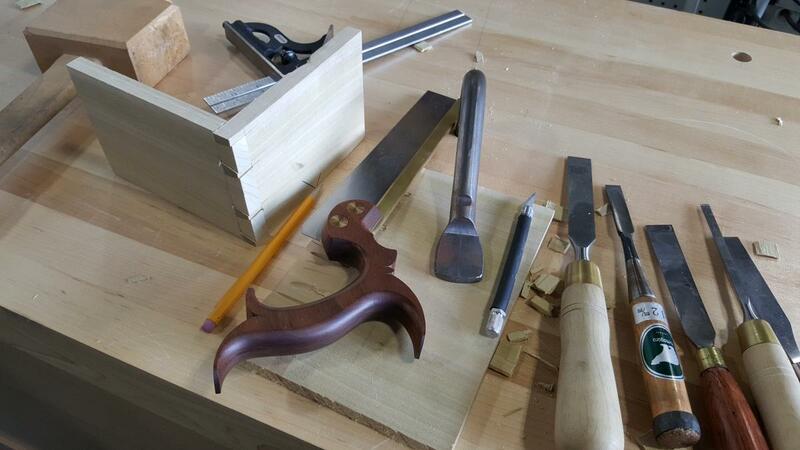 Back in the 1980's, when I took my first class in how to cut a dovetail, we used the following tools: saw, mallet, chisels, pencil, marking gauge, sliding bevel, square, and some clamps. We didn't use a dovetail gauge but set the sliding bevel to the appropriate ratio. We laid out the entire joint with a knife and pencil. I was taught to chop the waste out with a chisel - sawing the waste out wasn't common at that time. The lessons were slow and careful. The hardest part was sawing straight. More modern instruction might add a fretsaw to the list of tools for removing the waste. I have two problems with this approach. In the late 18th century thin, fragile, fretsaw blades were hand made, usually by the craftsman. They were not tools you would use for the rough work of chopping waste. The combination square hadn't been invented but wooden squares were common. Pencils not so much. Tools were expensive, and while an apprentice would use the master's tools in the beginning, as you can see in the Joiner and Cabinetmaker, written in 1839, the idea of using lots of specialist tools wasn't common. I also cannot imagine that the step-by-step instruction that we have today were used. Apprentices learned by paying attention, and mimicking their betters. In a typical blind dovetail drawer, the pins would have been very narrow and the tails wide. While some folks have written that this was a style and done for aesthetic reasons, I disagree. If you make your tails wide enough, and with tiny pins, it's really easy to waste away the bulk of the waste with a few extra cuts of the dovetail saw. (Note: in the picture above the pencil lines are just there to make sure I cut the tails in the right direction. The lines aren't guide lines for the saw - or straight). 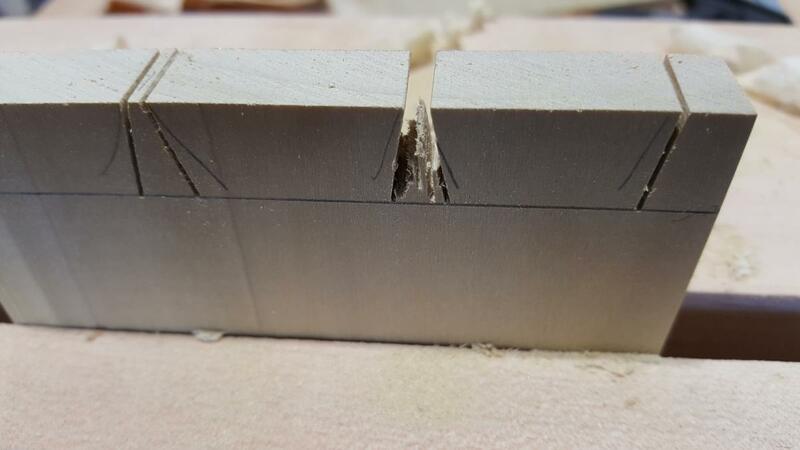 Chopping with a narrow chisel to the line then finishes up the job. Regarding the drawer fronts, with the sockets for the tails you can't use a fretsaw for much anyway; a wide chisel makes quick work of the waste. 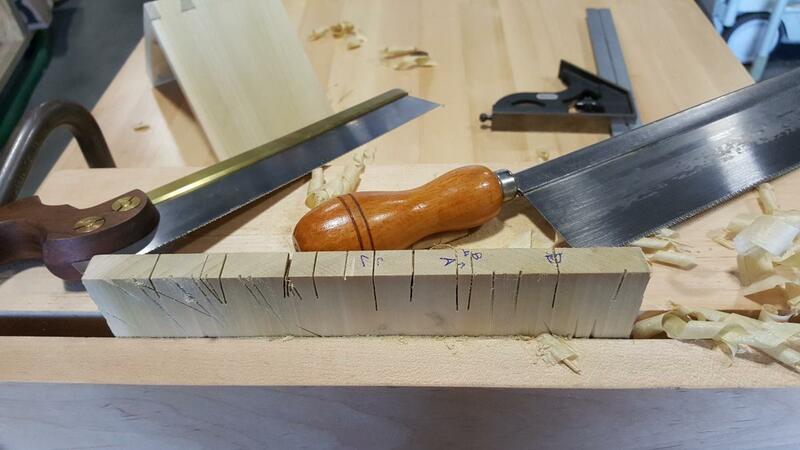 Chopping a space for a tail in a blind mortise is about the same amount of work no matter what the size of the tail. Dovetailing drawers was considered junior work. A question: By trying to emulate the sparse 18th century toolkit of an apprentice or journeyman, and cutting out some of the extra tools and steps, would it be easier to teach a novice how to do this basic joint? The answer would seem to hinge on the ability to consistently saw straight coupled with accurate layout. Everything else is pretty easy. But perhaps all activities needing hand eye coordination are similar? Golf, Basketball, Ping-Pong: All of these sports are about practice, not specific instructions for throwing a ball in each individual case. Once you master the basic hand motions, instruction can make you more efficient, and planning can make you more effective. I'm wondering if the difficulty beginners have in cutting dovetails is that we think too much. The adult education tradition for woodworking comes out of school instruction, often teaching a roomful of students who are mandated to be there. This is very different from teaching a small group of adults who WANT to be there. I am working hard on offering a class in basic joinery that relies on amplifying skills that we all already have - like carrying a glass of water without spilling. So far the class tool kit consists of a saw, a square, a marking knife, a marking gauge, and a chisel or two. I honestly believe that our dovetail saw makes it easier for someone to saw straight, but I also don't want to require everyone who takes our class to buy one of our saws if they don't want to. But a gent's saw - which is the next easiest thing - is affordable. I'm still working on the schedule, pondering whether it should be just a class in cutting a dovetail or a series of classes over several Saturdays (or weekday evenings) in which we grind, sharpen, learn to saw, and then make a dovetailed box. By the way our last two all-dayclasses, Modern Furniture Construction - Making a Kitchen Cabinet and a Building a Zig-Zag Chair went great and we are doing a second section on Modern Furniture Construction - Making a Kitchen Cabinet on July 8th. There a couple of seats still open click here for details. On July 15th, I am repeating my popular free class Sharpening 101. You are all invited. I can't make this class but would be interested in a future iteration. I have no issues at all with Japanese saws but now that quality western saws are available I find I can work faster and more accurately with western saws. I'm glad someone else finds the recent instruction about cutting DTs with 20 different kinds of saws, chisels, and measuring bobbles as a little over-the-top. Every time I see people in life or on a forum, they're amazed that I can make DTs by hand. I really don't get what's so hard about them. Just some input; I believe that a series of classes would be a little more welcoming to newer woodworkers as well as those looking to learn new skills or methods.